Xhea has no magic. Born without the power that everyone else takes for granted, Xhea is an outcastno way to earn a living, buy food, or change the life that fate has dealt her. Yet she has a unique talent: the ability to see ghosts and the tethers that bind them to the living world, which she uses to scratch out a bare existence in the ruins beneath the City’s floating Towers. When a rich City man comes to her with a young woman’s ghost tethered to his chest, Xhea has no idea that this ghost will change everything. The ghost, Shai, is a Radiant, a rare person who generates so much power that the Towers use it to fuel their magic, heedless of the pain such use causes. Shai’s home Tower is desperate to get the ghost back and force her into a bodyany bodyso that it can regain its position, while the Tower’s rivals seek the ghost to use her magic for their own ends. Caught between a multitude of enemies and desperate to save Shai, Xhea thinks herself powerlessuntil a strange magic wakes within her. Magic dark and slow, like rising smoke, like seeping oil. A magic whose very touch brings death. 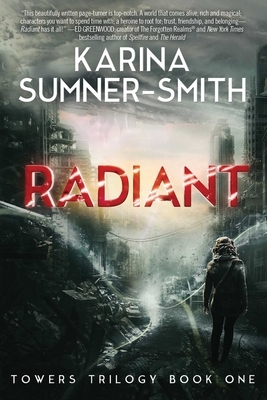 Karina Sumner-Smith is a Canadian author of fantasy, science fiction, and young adult. Her short fiction has appeared in The Living Dead 2, The Best Horror of the Year Volume Three, and Children of Magic, among others. Among being reprinted in a number of anthologies, her short stories have also been nominated for the Nebula Award and have been translated into Czech and Spanish. She lives in Ontario.